SikhNet responds in letter to Gursikh; SikhNet says, "SikhNet only has articles explaining the experiences of others who have practiced tantric yoga." Below is a response from SikhNet’s “customer service” to a letter from a Gursikh asking SikhNet why they promote and teach anti-Sikh tantric sexual yogas and Hindu poojas. SikhNet is obviously trying to be evasive in the letter. The fact is all of the staff at SikhNet practice Yogi Bhajan's tantric yoga and they're trying to cover this fact up. You see how clever SikhNet is. 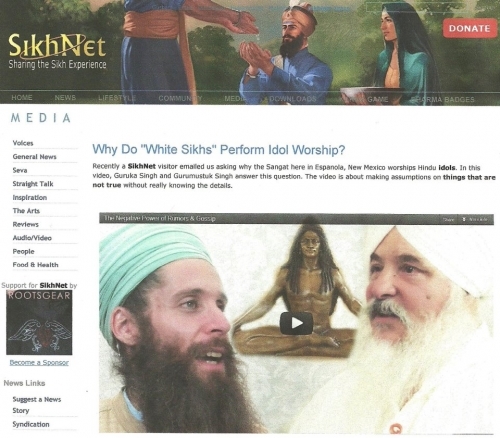 SikhNet's hidden agenda is clearly to subsume Sikhi into Hinduism! We only have articles explaining the experiences of others who have practiced tantric yoga. Please do let us know if we are able to help you regarding anything else. If you have any further questions, comments, suggestions or problems, please do not hesitate to contact us. I was just wondering why do many of u teach Tantric Yoga aka sexual yoga and practice hindu poojas? I mean in sikhism it is forbidden to do this practice.